Everything in this world undergoes change from time to time and that is the reason why the world is declared to be illusory. Sankaracharya (a great ancient saint) did not say that the world is absolutely unreal. He called it illusory, because it is a mixture of reality and unreality, appearing at one time and disappearing at another time. There is a substratum of reality underlying the illusory world. The changeless reality of Brahman is the substratum underlying the ever-changing, illusory world. Bhaarath is the birthplace of the Vedhas and of the Shaasthras, epics and Puraanas that have elaborated the principles enunciated therein for the education of the human. It is the nursery of music and other fine arts, inspired by the noble passion of consecrating human skills for adoring the Divine and communicating the super sensuous. It is the staff and sustenance of the mystic and the ascetic, the intellectual and the dynamic adorer of God; it is the field where the science of Yoga was cultivated and systematised. Thyaagaraaja (ancient poet and saint) sang of the dilemma that faces every one, when confronted with riches on the one hand and the Inner Reality of God on the other. Thyaagaraaja rejected riches and sought the Reality, instead. On this path towards Reality the main discipline for you is the control of the senses; if one gives them free rein, they will drag the seeker into calamity. Education must render you monarch of your talents, your tools for acquiring knowledge. The eye, the ear, the tongue are like wild horses that have no bit between the teeth; learn the art of dhyaana by which the senses can be controlled and the will directed inwards, towards the mastery of feelings and emotions. You can calmly consider own inner nature and resolve upon ways and means by which you can mould own destiny along the lines of Love and Contentment. The ideals laid down by Sanaathana Dharma (Eternal Religion) for ensuring a happy peaceful life are valid even today. Seekers attracted by its ancient lessons, teaching the way to acquire inner calm and inner light. They have found that manthras (sacred formulas) have potency to transform nature, that Vedhic recital can infuse harmony, that wrong pronunciation of manthras has deleterious effects. The Truth that there is perfect identity between the individual and universal is proclaimed at every breath by the silent announcement your breath makes' Soham (I am He). But, many do not open their eyes to the great opportunity. Reason is a bad guide in spiritual matters, unless it is rinsed of all traces of ego. Dedicate your heart to God; He will be one with you, the heart of your heart. However, be aware that devotion, when it knows no bounds, easily falls into hysteria. The experience-able and authentic Divine illumination can produce the correct recital of the Gaayathri Manthra with the orthodox Udhaattha, Anudhaattha and Swaritha, (modulation of the voice the higher, lower and even accents), whereas incorrect pronunciation and wrong accent result in thickening the darkness! Therefore, instead of scoffing at the disciplines of recitals, meditations, prayers, formulary worship and manthra-utterances, their values have to be accepted and their results tested and confirmed by practice and exercise. The greatest formula that can liberate, cleanse and elevate the mind is Raamanaama (the Name of Raama). Raama, the mystic potent sound, is born in the navel and it rises up to the tongue and dances gladly thereon. Raama is not to be identified with the hero of the Raamaayana. Vashishtha, the preceptor, said that he had chosen that Name since it meant, "He who pleases." While every one else pleases the sell nothing pleases the caged individualised self more than the free universal Self. The Self is therefore referred to as Aathma-Raama, the Self that confers unending joy. One bloodstream circulates through all the limbs; one Divine principle circulates through all the lands and peoples. The universe is the body of God. The summit is One, the tracks leading to it are many; the guides are also many; they clamour and compete among themselves. Seven blind men examined the elephant and imagined that it was what each one was able to touch; each one interpreted his touch - they could not get a complete and correct picture of the animal. Pictorially, Hindhuism is the stomach of the elephant, supplying strength and stamina to all other faiths. The limbs are the other faiths. Even those who assert that they did not find any trace of God in outer space, or who aver that God is dead, or that even if He is alive, He is no longer necessary for human, that He is a handicap and nuisance - all these have to admit that there is something inexplicable, something inscrutable, beyond the reach of reason and science, some unknown which pervades the world and affects the course of things! All people in all countries are pilgrims proceeding along the path to God. The progress of each is decided by the discipline adopted, the character formed, the ideal kept in view, the leadership chosen and the faith implanted. Just as trees and plants, birds and beasts differ from one region to another, the rituals, practices, disciplines and ideals may differ from community to community; each is good for that region and that stage of development. You cannot transplant one, from one human community to another. The atmosphere in which you have grown up is the most congenial for you. Human eyes see countries as different; in reality, all countries are limbs of one organism; all bodies are activated by the same Principle. Today's human has learnt to fly in the air like birds, and swim in the sea like fish. But human has not learnt how to live as noble person on the Earth. Religion can teach how to live as human on the Earth. So if science were to foster the all-round human's development it has to seek the aid of religion. Religion does not mean blind adherence to some beliefs. On the other hand, religion helps to attain the goal of human life based on discrimination and sacred values. No religion can ever be bad. That is why the great scientist, Einstein, declared that religion without science is lame and science without religion is blind, thereby stressing the need for a judicious combination of science and religion to serve the needs of humanity. Religion is of immense help in fostering the integral development of the human personality. True religion teaches the harmony and unity of all religions. The essence as well as the goal of all religions is the attainment of the purity of mind and heart. No religion preaches hatred, untruth or unrighteousness. "Speak the truth, practice righteousness" - enjoin the Upanishads. Similar sacred injunctions are to be found in all the other religions too. All religions emphasise the human values and serve as beacons for the proper progress and development of humanity. to their speeds and orbits? Light travels at the rate of 1,86,000 miles per second. In the Milky Way there are innumerable stars unknown to us. The light from some of the stars has not yet reached the Earth, despite the lapse of aeons since their creation. Even the scientists are in doldrums to understand fully such aspects of creation. What a contrast between the scientist who swells up with pride on account of discovering but a minute fraction of the mystery of creation, and the Creator (God) who is spreading the whole universe peacefully, silently, patiently and lovingly. Not this alone. The way this creation or Nature is functioning is amazing beyond words. For instance, the carbon dioxide exhaled by human is being taken up by the plants and the oxygen released by the plants is being inhaled. The scientist may explain away all such things as the "Law of Nature." But are these scientists able to transcend Nature or to dispense with the materials available in Nature ? We are prone to take the creation for granted, thinking that it is but insentient Nature, thereby ignoring the Sentient Principle that regulates nature and imparts a proper balance among its various constituents. Scientists and technologists, in pursuit of selfish interests as well as of name and fame, utterly disregard the security and welfare of the society by upsetting the balance in Nature, which results in various accidents, calamities, losses and misery to the public at large. In prehistoric times, men killed each other using bows and arrows; now they kill entire populations with the help of atom bombs; this is praised as remarkable advance! The scientist cannot stop the rise of greed and hate in the human heart; he can only forge the weapons they require and improve upon their lethal efficiency. Mankind lives in daily dread of extinction as a result of the discoveries of science; for, any moment, the storm of hate may rain the bombs on their homes! The indiscriminate exploitation of natural resources by the scientists and technologists such as various types of mines for extracting minerals, mica, coal, petrol and other oils results in imbalance and pollution of the five major elements, leading to catastrophes like earthquakes, and volcanoes, etc. The rapid and excessive proliferation of industries, facto-ties, automobiles, etc., with the attendant pollution of the atmosphere is responsible for the increasing incidence of diseases like eosinophilia, asthma, deafness, pneumonia and typhoid, etc. However, science per se is not bad; what is necessary is for man to put it to proper and judicious use. About fifty years back, scientists believed that them is no greater power than the atomic energy. They expressed the fear that if the atomic power is further split, it will lead to disaster. At present the scientists have been able to discover that there are greater powers than the atomic power. Along with physical sciences you should also try to understand the spiritual science to some extent at least. (Reet's compilation from, Sathya Sai Speaks. Vol. 8. "Atom of majesty," Chapter 8, "Name, the never-failing fountain," Chapter 18 and "Emergence of enthusiasm," Chapter 25; Sathya Sai Speaks. Vol. 9. "House and home," Chapter 13; Sathya Sai Speaks. Vol. 25. "The Mysteries Of Creation," Chapter 17). Health and happiness go together. Happiness is a vain dream if health is absent. The Shruthis (holy scriptures) declare that health is basic quality without it is impossible to realise any of the four goals of life, right doing, right desiring, right earning and final release.The mind too has to be healthy. It should not be clogged by greed, envy, hate or pride. It should not be polluted and poisoned by antisocial inhuman plans and projects. It should be calm and dear, so that thought can see into its depths and get rid of the evil feelings and tendencies it evokes. What has to be gained is not money, but, virtue. The means of sustenance are sought after and collected by birds and beasts; there is nothing specially human in this pursuit. When intelligence is used for the acquisition of food and physical comforts, human is lost in animal pursuits. Virtue is the panacea for both body and mind. The virtuous person can be both healthy and happy. How is virtue to be cultivated? How can it express itself in daily practice? Through service to living beings, through seva (voluntary selfless service). In order to urge humans into the path of mutual sympathy, continuous compassion and concrete service, they have been endowed with the instinct of gregariousness. Human is a social animal. Humans find solitary living, unnatural and miserable. The Ashraamas (monasteries) of ancient times were academics where mutual cooperation and loving service were encouraged. Doctors are the most important class of sevaks. When seva is rendered with love, intelligence and earnestness, it leads persons nearer and nearer to Divinity, for it draws unto itself the Grace of God. This is the reason why the scriptures elevate the vaidhya (doctor) to the status of God. If the doctor is full of love and compassion, God works through him. Doctors, therefore, have to endeavour to become the receptacles of Divine Power during their healing process. We may say that the behaviour, the voice, the mien of the doctor count for fifty per cent of the cure, the drugs and their efficacy manage the other half. Vedha. The Ayurvedha deals not only with the curing of illness but it also deals with the prevention of disease. One sacred duty of the doctor is to advise persons on how to preserve health and prevent disease. He has to be vigilant in society to discover and suppress every tendency in Aahaar and Vihaar (food habits and recreational activities) by which diseases are developed. The dress worn by humans, the houses where they live and the areas where they are situated, have to be tidy and clean. The food that is taken has to supply all elements needed to keep the body to resist illness. The atmosphere breathed in, the water taken in, the ground lived on, the animals and plants that surround - all have maleficent microbes that may cause illness, if the mind and body are not equipped with powerful resistance armour. Exercise, bathing, washing, cleaning, etc., are prescribed for this purpose. The body is the boat on which we voyage across the ocean of samsaar (worldly life) and it has to be kept trim and sea-worthy. The voyager too has to be strong, confident and courageous. The current belief is that medicine is to be valued for its validity during illness. Its use ends with the cure. But this point of view has to change. Medicine is used to see that one does not fall ill, not so much as to raise him up when he falls. However, for happy and meaningful life it is not enough to have only a physical health. The mental health and spiritual awareness are the factors what help too to keep the body strong as they are interconnected. One must learn how to keep your impulses under control, and to master the senses that tend to drag you into wrong and vicious paths. When the desire for pleasure overcomes your reason and your innate goodness, you are left only with the shape and form of a human being; you have no right to be called a human being. person to be a jnaani (liberated person, he has passed through these two stages. Science or the study of observable sensory matter, of measurable and calculable items, can give only incomplete information. The sea has pearls in its depths; but, you have to dive into it to secure them. Humanness and Godness co-exist as inseparables; they are the negative and positive poles, that have to be together to produce the warmth of love and the light of wisdom. Once you have established your Self in the Higher Self, you would not get lost; you can then wander freely in the realms of the Unreal. If you have not experienced the Self as a spark of the Supreme Self, your wanderings will be as fruitless as the trekkings that animals do, by instinct. Believe that God is the inner Truth in every thing and being. Be humble, before the evidences of His Power and Majesty. Vedhas declare: "Revere your mother as God; Revere your father as God; Revere your Teacher as God; Speak Truth; Act Righteously." These five are as the five vital airs that sustain the body of human. Believe that they have been laid down for your material and spiritual progress. That will ensure success in your pilgrimage from humanness to Divinity. Human does not discriminate and discover the special excellence of his own faith, as compared with the faiths of others, or, the difference between his beliefs and religion and the beliefs and religion that others hold dear. He/she does not evaluate own viewpoint, in the light of the viewpoints and attitudes of others. He/she does not weigh own acts and judge them, as worthwhile or waste. The seers and sages of ancient India have laid emphasis on this discipline and prescribed measures to achieve these ends. The remedies have prescribed in the ancient texts. People who are completely ignorant have no doubts or misgivings; those who are fully wise, too, have no doubts or misgivings. It is the half-baked variety of scholars and students that fall into the traps laid by the prejudiced and perverted. Education should insist on their assimilating the essence of the teaching which they elaborate. Now, students direct all their efforts towards acquiring more and more knowledge of just one specialised branch of learning. So, they are woefully deficient in general knowledge, and are unable to adjust their behaviour or conduct, and survive the vagaries of fortune. Education does not end with the accumulation of information; it must result in transformation of the habits, character and aspirations of the individual. But, human is interested in everyone except own self. Human being is like a man standing on the bank of the Ganga, and crying that he is having unbearable thirst. He has in him the very embodiment of Peace, Bliss and Love. But, he has no knowledge of this. Enormous energy and expenses are being devoted for investigating the mysteries of the atom. But there is no comparable concern for developing human behaviour. Politics and economics are bedevilled by crises. People are riven by caste and religious conflicts. The appetite for power and position has become insatiable. What is the reason for the divergence between scientific progress on the-one side and the social and moral decline of man on the other? By ancient saints had realised that one can get enduring peace and happiness only by spiritual realisation and not by any other means. If there is no love of God, fear of sin, and practice of social ethics, how can there be peace in the world? Scientists and political leaders are teaching all kinds of things to the youth. But of what use are these teachings? Youth needs the example of leaders who stand up for integrity and morality. (Reet's compilation from, Sathya Sai Speaks. Vol. 12 Limits that liberate," Chapter 34; Sathya Sai Speaks. Vol. 14. "The four blemishes," Chapter 15 and "The doctor's profession," Chapter 53; Sathya Sai Speaks. Vol. 24. "Bhagavan's call to students," Chapter 7). What you think exists, is not real. What you think does not exist, is the Reality. Which is not pervaded by God. Once upon an ancient time, six young disciples, who were keen to learn about the mystery of existence and the true purpose of human birth and wished to investigate the goals of life, came to the sage Pippalada. The sage at first explained that for undertaking any task, one has to have the minimum competence. Without that competence, even the answers will be beyond one's comprehension. Even for doing the smallest task, one has to acquire the requisite fitness. If one wants to build a bridge, he must be a qualified engineer. This applies equally to every undertaking in the world. 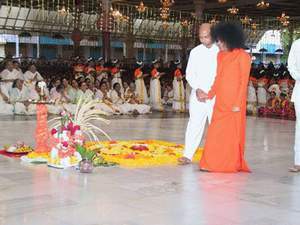 Swami's Teaching is a bottomless source for spiritual compentence for every aspirant. However, nothing can attain without serious study. All the conceivable doubts that could arise in any person were placed before sage Pippalada by the six young disciples and they got from him the right answers. Pippalada asked the disciples to control their thoughts as their thoughts and nothing else determine their vision of the world. The sage taught that this awareness should be the primary objective. In that awareness, the identification with the body consciousness goes and the oneness of the Atma in all is realised. This is the message of the Prasnopanishad what is actual today and after many thousand years. The universe is not different from God. The Prasnopanishad expatiates on this cosmic unity. In every padaartham (object) there is a paraartham (Divine element). Without this Divine basis, no object will be cognisable. A being without life is as good as non-existent. The divine element is the basis of the physical substance. basis, no living being without the vital force and no inert substance without consciousness. In the universe, both matter and chaitanya (consciousness) are self-existing. The cosmos is the synthesis in consciousness of these two (spirit and matter). Pippalada explained that by the Divine will of Prajapathi (the cosmic progenitor), two pairs were created; the subtle and the gross, the inert and consciousness. By the union of the two, the entire cosmos, consisting of animate and inanimate objects, was created. The secret of creation that it is God without a beginning or an end. The entire cosmos consisting of moving and unmoving objects is mithya (illusory). Although there is the Real in the illusory Universe, all that is perceived in the phenomenal world is liable to pass away. Creation has no predetermined limits. It is an eternal process whose beginning or end cannot be known. In the process of birth, growth and dissolution, besides the will of the Lord, the role of human effort can also be recognised to a certain extent. Death exists as well as birth. Human's destiny is determined by the nature of his actions, thoughts and desires. No one can tell how human came into existence and the circumstances of ones origin. But human has the capacity to free himself from rebirth. When the desires are replaced by the Brahmic (Atmic)consciousness and the mind is emptied of all other thoughts, there will be no rebirth. As long as one's life is immersed in delusion, as long as delusion remains, the Absolute cannot be realised. The Absolute is realised by absorption in the Brahmam and then there is no rebirth. All phenomena relating to Time are associated with Prajapathi. Time is a manifestation of Prajapathi. Time moves in two directions Uttarayana and Dakshinayana. ('Ayana’ means journeying). When the apparent movement of the Sun is northwards, the period is termed Uttarayana. When the apparent movement is southward, it is called Dakshinayana. The period of Uttarayana is marked by brightness, peace, rejoicing, fearlessness, and purity. Dakshinayana is characterised by darkness, peacelessness, fear and disasters. By Pippalada life redeems itself only when it merges in Prana. The Prana (Life-Principle) is the most important factor. You have to merge yourselves in the mind. Merge the mind in the Atma. Whatever you do, do it in a spirit of dedication to the Atma (the Divine, God). When you practise it in a spirit of dedication, work will be transformed into worship. When life is led in such manner, there is no rebirth. Thoughts are in tune with desires. According to the thoughts, the results follow. A living creature proclaims its existence by the Life-Principle in it. This truth has been recognised by the Vedic sages and modem scientists in the concept of the convertibility of matter and energy. There is no basic difference between the revelation of the scriptures and the discoveries of science. However, many consider that spirituality has no concern with mundane affairs and there is no connection between the physical world and the realm of the Spirit. This is a grievous mistake. One is the base and the other is sustained by it. One is prana (life) and the other is the prani (living being). Likewise, life and the living being exist naturally. Below is more proper Vedic explanation to this phenomenon. By Pippalada five basic elements (ether, air, fire, water and earth) are like five feet for the Sun. The twelve months correspond to twelve seasons for the Sun. The passage through the twelve "houses" endows the Sun with seven colours. Every month has two halves - the Sukla Paksha (bright fortnight) and the Krishna Paksha (dark fortnight). On Full-moon night, it shines with all its sixteen Kalas (aspects) illumined. On Amavasya (New Moon) night, the moon receives no light from the Sun and hence it is totally dark. The fortnight after the full moon, when the moon starts waning, is called Krishna paksha, the dark fortnight. The fortnight after Amavasya (New Moon) when the moon goes on waxing is called Sukla paksha, the bright fortnight. Sukla paksha is Prana (life) and Krishna paksha is Praani (the living being). The entire cosmos is made up of the combination of Prana (the Life-breath) and Praani (the container of the Life-breath). All these are manifestations of the creative power of Prajapathi. From Akaasa (ether), Vaayu (air), Tejas (effulgence or fire), water and earth emerged in succession. The faculties corresponding to these elements are speech, sight, hearing and thought (or mind). Controlling all of them is Prana (the Life-Force). The abode of this Life-Force is the body. The Life-Force operates using the body as its sanctum. Prana is timeless in its origin, but seeks an abode in a new body. In this body, the Sahasraara Nadis (nerves) enter all subsidiary organs and function throughout the body. There are 72 crores (720 millions) of nerves in this body. goes to heaven or hell or any other place, it is his own actions that are responsible. No one can fully explain the secret of creation. There is a shadow which closely follows every object. When the Prana leaves one body and enters another, the results of one's actions follow the Prana to the other body. The Prana enters another appropriate body in accordance with the results of the actions in the previous body. You alone are responsible for your joys and sorrows. God is in no way responsible. He is only a witness. But if you pray to Him with all your heart and soul, the effects of all karmas will disappear like mist. Devotion, sadhana performed with deep faith will free human from the consequences of deeds. Real sadhana consists in transforming bad into good, converting sorrow into joy. This calls for the right use of the mind. However, there can be no happiness without sorrow, no good without the bad. In creation there are many things which are naturally bad by human's understanding. Out of these bad things, good emerges. The mind is the cause of all our sorrows and joys. The powers of the mind are indescribable. In one moment it can encompass the universe. It is not possible for anyone to know in what form, in what situation, at what time and in what circumstances the Lord appears to teach human how to get rid of bad thoughts, bad qualities and bad actions. Hence, do not blame God for anything. For all your difficulties and joys, your actions alone you are responsible. Keeping this truth in mind, you have to follow the path of righteousness. (Reet's compilation from, Sathya Sai Speaks: Vol. 24. ."The Divine and the Cosmos," Chapter 12; "Birth: Rebirth: Freedom," Chapter 13 and "Face the challenges of life," Chapter 18). PS: The word 'Prana' has explained in brackets little differently according to the meaning of context.